The Ithaca Board of Realtors celebrated their own housewarming on their 90th anniversary, and in celebration of Fair Housing Month. On April 11, 2017 at 2:15pm, participants from local government, the real estate community, and the Chamber of Commerce came together to cut the ribbon for 957 Mitchell Street in Ithaca – the new home of the Ithaca Board of Realtors. Tompkins County Chamber of Commerce President Jennifer Tavares began the remarks stating “We are really grateful that you are now homeowners and that you are continuing to do great work for all of us in the community. Thank you on behalf of the Chamber and congratulations.” The Board of Realtors has been working on the planning committee for the Tompkins County Housing Summit, and has shown a commitment to addressing the affordable housing crisis in Tompkins County. The ribbon cutting not only welcomed the Board of Realtors into their new home, but also recognized that April is Fair Housing Month. A representative from NY Congressman Tom Reed’s office presented the Ithaca Board of Realtors with a proclamation congratulating them. In recognition of Fair Housing Month and the work that the Board of Realtors had done on the Tompkins County Housing Summit, Tompkins County Office of Human Rights Director Karen Baer read a statement about the 1968 Fair Housing Act and the important principles that create opportunities for housing for all. Dan DiSanto, Board of Realtors President remarked “On the 90th anniversary of the Ithaca Board of Realtors, we are happy to finally be homeowners. 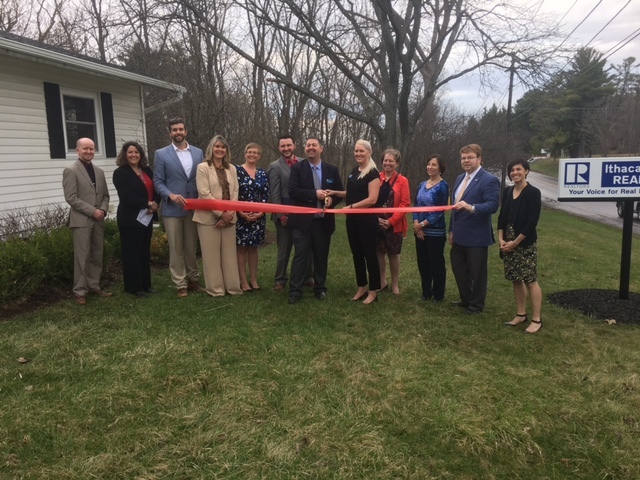 We’re truly happy to be here.” And Melissa Miller Fedrizzi, Regional VP of Realtors for the Southern Tier for NYSAR thanked everyone and welcomed the board to their new home. Prev:Member Profile: Ithaca Farm Making a Difference On and Off the Table with Green Fork NY!